Keith Olbermann, #106 …. 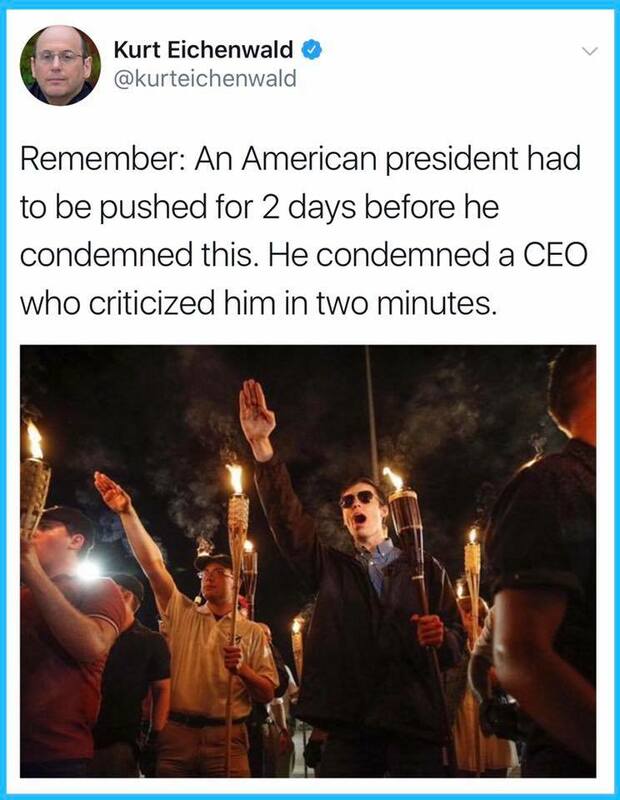 “😡 Drumpf and Charlottesville, Virginia …. Too Little, Too Late 😡 …. “!! Isn’t it time for everyone to be honest and call white supremacists the domestic terrorists that they are? Every Republican who ever played footsie with the militias out west owns this bloodshed. When anybody, especially the ‘so-called president’, talks about what happened in Charlottesville, Virginia, over the weekend, from the Citronella Putsch on Friday night, August 11, to the violence on Saturday morning, to the graphic fulfillment of the philosophy behind these lunatic laws on Saturday afternoon, tells you that what happened in Virginia has anything to do with “polarization,” or that it is a problem equally shared by Both Sides, that person is trying preemptively to pick history’s pockets. He has posted installment #106. He finally spoke – and said virtually nothing. IOTD …. Image of the day, #625 …. “Love is Love is Love is Love …. Rainbow Hearts …. “!! “Love is love is love is love is love is love is love is love, cannot be killed or swept aside,” Hamilton mastermind Lin-Manuel Miranda said, near tears, as he accepted his Tony award for Best Score. Thoughts for today, #462 …. “Dr. Seuss …. right on point …. “!! Viola Davis …. Meryl Streep Lifetime Achievement Award …. “Golden Globe Awards 2017 …. “!! Almost a week ago, this event took place in Hollywood. The introduction by Viola Davis is one for the books. It shows the immense inspiration which Meryl has provided for Viola. It’s a very special story worth of a listen. Here is the full intro and Meryl’s unequivocal message. Remember, this is the Cecil B. deMille Award Lifetime Achievement Award! Any one dared call Meryl over-rated? If possible I admire her even more as a performer, entertainer, actress and,mostly. human being! Meryl Streep is the recipient of the Cecil B. deMille Award of the 74th Golden Globes. With eight Golden Globes and 29 nominations, Meryl Streep is an icon of the performing arts. She was be honored with the 2017 Cecil B. deMille Award at the 74th Annual Golden Globe® Awards on Sunday, January 8, 2017, hosted by Jimmy Fallon. Lorenzo Soria, President of the Hollywood Foreign Press Association (HFPA), made the announcement of Meryl Streep’s honor. It’s no surprise that the HFPA has chosen Meryl Streep as the recipient of the 2017 Cecil B. DeMille Award. Meryl’s enthralling body of work across a diverse set of genres has made her a role model over the past 40 years, and she will continue to do so for generations to come. She has always taken roles with strong female leads, creating art by showing vulnerability and portraying truth on the big screen. Simply put, she is a trailblazer, having paved the way for women in television, film and stage. For shattering gender and age barriers, all with finesse and grace, the HFPA is humbled to bestow this honor upon her. Chosen by the HFPA Board of Directors, the Cecil B. deMille Award is given annually to a talented individual for outstanding contributions to the world of entertainment.